Welcome to your Risk Management platform! 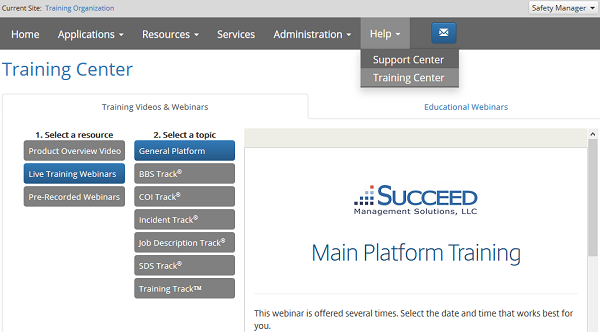 The Risk Management Platform provides access to an expansive library of risk management documents, training materials, and HR and benefits resources as well as optional applications to manage employee training, work-related incidents, job descriptions, job hazard analyses, certificates of insurance, and safety data sheets. Click here for instructions from Microsoft regarding your personal Safe Sender list in Outlook. Most clients are introduced to their accounts through the registration email. This communication will provide an overview of account features as well as your initial log-in information. Your provider's banner will appear in place of the blue banner below and their contact information is included at the foot of the message. The first time that you log in, you will be asked to enter some information to help prepare your account. You can enter a custom username and password at the bottom of this form. Click Save to load your new account. This section will help guide you through the steps and best practices to set up and begin using your new account. Not all features are included in all accounts. If you have any questions or need any assistance, please feel free to contact us using the options to the right. OSHA states that organizations must keep a separate OSHA 300 Log for each establishment that is expected to be in operation for one year or longer. We recommend setting sites up in your account using the same guideline. This help article covers the steps necessary to add sites to your account. Your account is capable of supporting multiple users with different permissions for each section of the platform. A role can be assigned to multiple users in multiple sites. 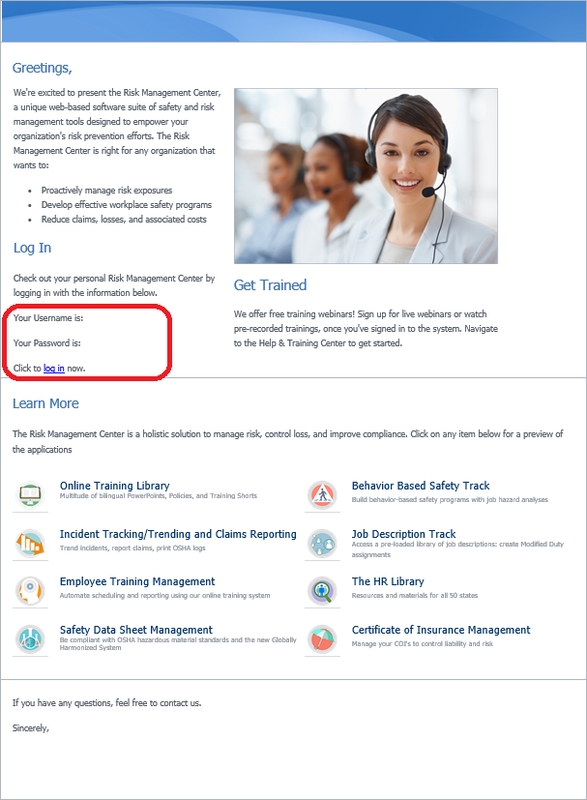 We recommend naming your roles according to the function of the users to which it will be assigned, or reflective of the included permissions, such as Training Coordinator, Incident Manager, or Full Access. This support article discusses creating and managing roles. Once your account is set up with the desired sites and roles, you are ready to add users to your account. Each user will log in using their own username and password and will have access to the platform according to the roles that they are granted in each site. Users must be assigned to at least one site before they are able to access the platform. Click here to read more about managing users in your account. While users can access the platform and perform administrative functions, employees only have access to the Employee Portal. Employees can be indicated in incidents, assigned training or audits, and be the subjects of safety observations. Each site in your account will have its own distinct list of employees. We recommend using the bulk import feature to add employees to your account, and to include an employee ID number with each record. Doing so will allow you to re-use the import spreadsheet to make changes to employee records and add or archive employees. Important! : Be sure to select the desired site in your account before adding or importing employees. You can customize various aspects of the platform on the Organization Settings page, such as what company information is used in incident reports, whether the primary site shares its My Content with other sites, time zone, and custom labels.